Front-end PCB design requires detailed analysis, mainly functional conflict resolution and the unambiguous capture of goals and constraints. Cadence® technology supports multiple design approaches for accurate simulations and tradeoffs. Cadence PCB layout and routing technology offers a scalable, easy-to-use, constraint-driven PCB design solution for simple to complex PCBs, including those with RF etch components. It also includes innovative new auto-interactive technologies that efficiently and quickly accelerate routing of highly constrained high-speed interfaces. 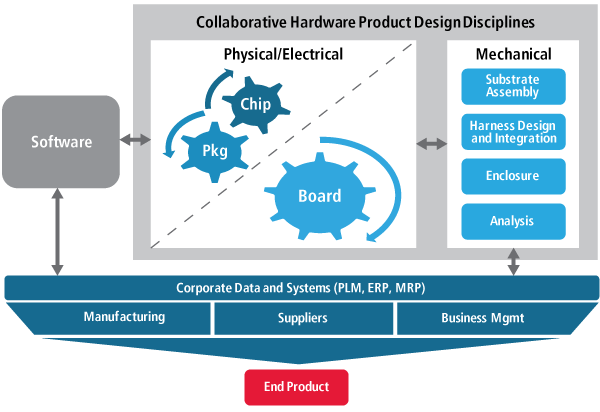 Cadence PCB design tools streamline the process for ECAD/MCAD collaboration using industry-standard EDMD (IDX) schema and design data handoff to manufacturing through modern, industry-standard IPC-2581. Stresses on signal and power integrity grow with every increase in speed, complexity, and miniaturization. Cadence SI/PI technology helps you address everything from simple electrical analysis to multi-board signal simulations in the multi-gigabit range. The AiDT feature in Allegro PCB Designer ended our frustrations over all of the time we were spending on routing and tuning. All of hours we're saving as a team [now] can be directed toward new project requests for the business. By implementing the Cadence Allegro platform in our design, we have improved our PCB design productivity by 30%. A project that would have taken six weeks using our previous tools was completed in less than four weeks.